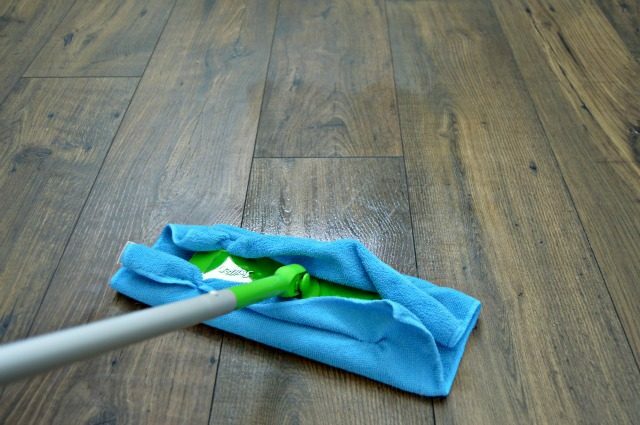 Once you have made this easy homemade wood floor cleaner, you will never have to buy the expensive store bought solutions again! Last year we had new floors installed, and I have to be honest…they terrified me! Everyone was telling me that they were beautiful, but they would be a pain to clean. I was told that you can’t use a regular mopping solution and water with a mop like I was used to using on our tile floors. And…you definitely couldn’t use a vacuum cleaner on them…that would scratch them. Once they were installed, I ran right out and bought the most expensive wood floor mopping system I could find at Target. After about 3 months of doing this, I thought there had to be a better way. So, I decided to try and make my own Wood Floor Cleaner. I was a little nervous to use it on my floors even though I had read that is was more than safe to use, so I set up some of the extra pieces of flooring in my garage and tested it out for a week. I used it every single day for seven days in a row, and it worked perfectly! Not only did my floors come clean, but the solution dried super fast, so there was no worry of it sitting on top of my floors and warping them. Woohoo! I also learned that you don’t need to buy the expensive dry mop…nope, just an old Swiffer mop (without their expensive replacement pads, and a microfiber cloth are needed to get the job done! You can find my Homemade Wood Floor Cleaner HERE on eHow where I share tons of cleaning and organizing tips! p.s. This cleaning solution works on laminate and tiles as well! Your floors are going to love you! I use to be a floor tech as a part time job for a little extra money when I was younger. I know this might be kinda hard to believe but you might be surprised to find out that a lot of those big cleaning companies use Windex to get floors so clean and nice and shine. We used it on tile and wood floors. Is there anything for laminate flooring? I can’t believe how well this works! Thank you! My cat has the habit of urinating outside of her litter box if there is the slightest of her last use. She’s VERY clean! Do u have any tips on to get that smell off of wood floors and/or kitchen floors? Hi Sherry, I can’t seem to find the quantities needed to produce the solution, could you please share them? Thanks! My tenant had a cat who destroyed a carpet. The urine soaked down into the concrete. I tried many products to no avail. Then I used peroxide and it did the trick. I do not know how that would work on wood floors. I read that vinegar is bad for hardwood floors.